Robert Downey Jr. posted a touching tribute to Chris Evans on social media. Reshoots for Avengers 4 are currently underway, but Evans is finished as of this week, and posted a thank you on social media to all of the cast, crew, and fans for their support over the years as he exits the Marvel Cinematic Universe. Evans extended his MCU contract to be a part of Avengers 4, but it appears that it’s the end of the road for Steve Rogers now. Robert Downey Jr. posted a picture of Buzz Lightyear and Woody from the Toy Story franchise. The poster says, “To Infinity (War) and Beyond,” with the “war” hand-drawn in. Downey Jr. then captioned the picture by saying, “We all know who the real sheriff in town is Chris Evans.” The post has since started to go viral and has been liked over 100,000 times as of this writing. Those original Avengers actors are a real family off screen, and this latest post from Downey Jr. is further proof of that. Chris Evans is done playing Captain America and it’s believed that Robert Downey Jr. will follow, since his contract is up as well. Both actors have talked about leaving the MCU party before they get thrown out, noting that the films take a physical toll on their bodies. Plus, it might be cool to be known for playing other characters that aren’t superheroes. While they’re both probably not returning after Avengers 4, MCU fans are holding out hope that they make cameos in Phase 4. However, that will all have to do with how the Russo Brothers have ended their current story arcs. 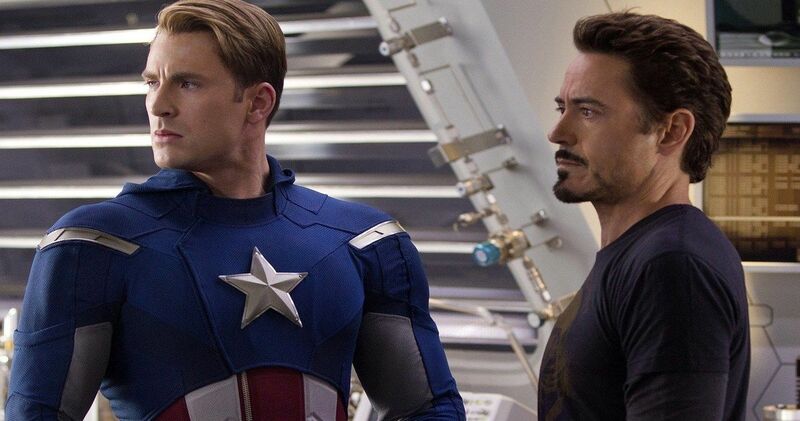 Avengers 4 could very well kill off Steve Rogers and Tony Stark, which would be pretty hard to see on the big screen for fans. But, it was originally thought that one or both of the characters was going to die at the end of Infinity War, which obviously did not happen. As with anything that Marvel Studios does, the story for the upcoming film is being kept secret, so we won’t really know how everything turns out for our heroes until Avengers 4 hits theaters next year, after the release of Captain Marvel. As for Avengers 4, we still don’t even have the official title of the movie yet. Mark Ruffalo trolled MCU fans pretty hard last night by announcing that he let some sensitive information about the movie leak. However, it was just a clever way to get people to tune in and watch The Tonight Show and promote voting before the midterm elections. The Captain Marvel trailer was just released, so it will be a bit longer before Marvel Studios decides to start the Avengers 4 marketing campaign. While we wait for more information, you can check out Iron Man’s touching tribute to Captain America below, thanks to Robert Downey Jr.’s Twitter account.